I found Writing with a Photos (More than words can say alone) a very interesting read. Pictures do add emotions and feelings to words…..an important part of the reading context. Pictures make the words come to life. Think about media (commercials) and the influence video/pictures/words have on us as a society. We have so many tools that can be used in the classroom to enhance our reading, writing, and thinking. The article above mentions several. Recently, I came across Muzy. Muzy would be a great photoblog to be used in the classroom for comparing/contrasting, sharing pictures, and writing/collaborative discussions on pictures posted. One-Click Sharing – Click the button and start sharing your screen in under 5 seconds (Java required to share). I love this tool. I have used it several times from my office to share my screen…easy! MentorMob – Probably the coolest site I’ve come across this year. MentorMob is a place where teachers can curate the web into learning playlists and then share them with their students via a link or embedding into a site. Pinterest – This is the most popular site on my list and another great site for curating the web. Lots of educators can be found on here sharing and “pinning” great sites for education. Nearpod – A terrific free iPad app that teachers use to create interactive presentations then share on student’s iPad devices. Students then use their Nearpod app to submit responses which teachers can then assess on their own Nearpod app. Edshelf – One of my favorite sites of the year. Ideal for educators to find educational technology sites or curate them into shelves. ClassBadges – A fantastic new site that allows teachers to award digital badges to students for accomplishments. FluencyFinder – A innovative new iOS app for assessing student’s reading fluency. This is a very simple app to use and get instant real-time results for assessing student’s reading fluency. 3D Toad – An amazing site for finding interactive educational images that a person can zoom in and out and rotate 360 degrees. SendHub – A fantastic way to send free text or group messages to parents/students. BeeClip EDU – A great site with educational portal (no student email necessary to register) that is ideal for students for creating digital scrapbooks. The Answer Pad – This is a great site/iPad app combo that allows teachers to create answer sheets online and then assign them to students. The students then using a free app fill in the answer sheet, show their work, etc and then submit to their teacher which they get instant real-time results/graphs. WatchKnowLearn – A site that reminds me a lot of Discovery Streaming and is great for finding educational videos for K-12. Nanoogo – A wonderful new site that gives students/teachers a digital canvas to ignite creativity and share lessons/ideas/work etc in a new and exciting way. Class Dojo iOS App – A wonderful free iOS app that interacts with the fantastic behavior management site. Teachers can award or discipline students via a mobile device without having to be worried about being tied down to a desktop machine. iBooks Author – A free iPad app for creating interactive digital books. This could be a game changer in education as more and more text books are being phased out. SideVibe – A great way to take any content from the web and turn it into an activity for students. OuiBox – A great site for writing. Cites sources, annotates, and more as you write. Flocabulary -A neat site for finding teaching lessons, songs, and videos through the use of educational hip hop. Remind 101 – A great and safe way to text parents/students. PicMonkey – An excellent free online photo editor where users can upload photos to edit, create collages and more. GoClass – GoClass is an excellent web based app for the iPad that works a bit like Nearpod. It allows teachers to manage their class on the web and then create assignments that students take on their iPad. Teachers can then assess student’s work via the web or the iPad app. NoRedInk – A terrific site for helping student with their grammar and writing skills. Teachers can assign lessons and quizzes as well as tracking student progress. MeoGraph – An innovative new site for four dimensional storytelling that has an educational portal. Inklewriter – A fun site that allows students to write creative stories online for free. It works by adding to a current story or starting your own and then branching off to where you want to go. It’s great for collaborating with others and once it’s finished it gets published online and can be shared with others. 9 Slides – A fantastic site for adding narration or video to slideshows. This is great for professional development or for explaining and introducing a new concept or subject. Winged Sandals – This is my favorite site for all things Greek Mythology, great for finding out interesting facts, images, pictures and games. theLearnia – A nice educational social learning network that is great for students and educators to share and learn knowledge through online lessons. Playfic – This is a site after my own heart that allows users to create, play, and remix online text based games (Zork anyone?). A great way to interact with others and strengthen your writing/grammar skills. Teachers Tech – Wonderful iOS app for finding “how to” videos on all things Web 2.0 related in the classroom. Trash Chaos – A fun original iPad app for learning about recycling. This app is ideal for younger kids, has excellent animated graphics and by a top-notch company, Yogome. Humanline – One of the best new sites around for finding free educational images. Hello Slide – This is a very cool site that gives a voice or narration to slides by simply typing what you want it to say. Moms with Apps – A great place for finding educational apps as well as learning about other great mobile programs such as App Friday. InSkilled – A unique site that allows users to track and share what they learn online through a very useful self-paced interface. Musicshake Edu – Students create music online that can then be downloaded or used anywhere. List.ly – A great way to curate the web into lists and then share with others or embed into a site. Knowmia – A nice place to find educational videos on 1000s of lessons for every subject. Ideal for high school level. Nulu – A innovative site for learning Spanish by reading relative articles on a wide variety of subjects that is translated into Spanish. A user can then select which words are difficult for them to help guide his or her learning. Storyboard That – Excellent web tool for students to visual tell a story through a storyboard. This is ideal for digital storytelling as well as brainstorming new ideas. Snip.it – A fun site for curating the web into thumbnails similar to Pinterest. Educreations – This is a wonderful site/iPad app for creating a lesson on a digital whiteboard, then recording what’s happening. QR Voice – A neat way to add a voice to a QR code. Backpack TV – A nice site for educational videos on a wide variety of subjects. SpellingCity iOS app – A great free iOS app that goes hand and hand with the SpellingCity website. Students can access 100s of word lists and lots of popular games and activities. MinecraftEdu – The popular PC is now being used in education to build creative worlds and geographical landmarks/buildings. ClassPager – Turns your mobile device into a classroom clicker for text messages, responding to polls, and more. CubertsCube – This is a fun site that allows students to polish their writing skills by working and getting feedback from others. ACMI Generator – This is a great place to find or creating writing prompts to build a story. GradeCam – Use any web or document camera to scan in assignments and have it graded instantly with real-time feedback. Toontastic – One of my favorite iPad apps for digital storytelling. Kids select their characters and backgrounds and add their voice to create a story. Knowit – Another nice site for curating the web and saving on sorts of resources to share with others. Google Cloud Print – This is an amazing way to print to any printer from any device anywhere as long as the printer supports GCP. Alien Buddies – A fun app for young learners where they can take part in many activities such as: matching, puzzles, stickers, and connect the dots. History Engine – The History Engine is an ambitious project that puts the student in the part of a historian to creating stunning projects. Teachers with Apps – A fantastic site for finding detailed reviews with images of educational apps. Understoodit – A very simple idea for a site that works. A teacher creates a page where students click understand or confused (about any subject the teacher is teaching) and the teacher gets instant real-time feedback. Literacy Shed – A great place to find resources for literacy on a wide range of topics. United Classrooms – This is a global social learning network that connects classrooms around the world. AnMisH – A fun site for digital storytelling where you can use your own image as one of the characters. Every1Speaks – A great way to harvest an idea by collaborating with others and introducing into a school setting. Essay Tagger – A stunningly simple way to grade essays through a web based tool. Famigo – A fun site to find and download educational apps. Flash Card Maker – A cool iOS app for kids to create flash cards using their own images and text. QuizSlides – Create quizzes from PPTs or PDFs and view results online. Learnist – Is like an educational version Pinterest with the ability to curate more then just sites such as videos, audio, etc. myHistro – A terrific site/app for creating interactive timelines that integrates with Google Maps. WikiBrains – A great site for social brainstorming that is very easy and fun to use. Chegg – This is a great site for renting, selling, or buying text books. Also, it has an educational portal which is great for finding step-by-step help on homework problems. Maily – A fantastic free iPad app that is geared for younger kids to teach them how to email in a safe environment. KidzVuz – A fun site for kids to find reviews of videos by kids. Share my Lesson – A great site for teachers to find educational resources developed by teachers. Avatar Classroom – An innovative site, it’s a web based classroom hosted in a virtual world, similar to MyLife. I Tell a Story – An excellent free iOS app for digital storytelling that reminds me a lot of the way Garageband is used to create a podcast. Tioki – This is a nice network for educators to collaborate and share resources. DuoLingo – A neat site for learning a foreign language by translating different articles on the web with others. LyricsGaps – A very fun site for learning a foreign language by filling in gaps of a song that are missing. Quick ScreenShare – This is a very handy web tool that allows people to share their screen with no registration needed. This is a great way to help troubleshoot or explain things to people by showing them your computer screen. Moo-O – A entertaining site that is puts kids right in the middle of the story and helps nurture their love of reading. Teach with Portals – A interesting site for gamification that uses the award winning Portal PC game for teaching. This site has a nice help forum as well as lesson plans on how to integrate into the classroom. Miracle of Life – One of the most beautiful looking iPad apps that I have ever seen. This app is in both English & Spanish and focuses on the human growth cycle. EdSurge – A community that is great for educators that has excellent articles as well as product reviews. Grammar Bytes – A great site for all things grammar such as handouts, definitions, presentations, videos, and more. Problem-Attic – A nice site to find and customize educational resources based on Regent exams in Math, Science, Social Studies, and English. Power my Learning – One of my favorite sites for finding educational activities on a wide range of subjects. BusyTeacher – A terrific site for finding free printable worksheets as well as resources for ESL teachers. Lingt Classroom – A cool site for learning a foreign language by creating voice based lessons. Storybricks – A great site for digital storytelling that uses MMO and gamification to create a creative/unique story. C-Fit – Consists of a series of iOS apps designed to keep kids healthy by engaging in exercise via walk-through videos. Story Patch – A fantastic iOS app for digital storytelling that goes through the step by step process of telling a story. Kindertown – A great site/app for finding educational apps for Pre-schoolers and young kids. Creating Music – A nice site for learning different terms and composing your own music. Google Course Builder – A new project by Google to help people build their own online courses uses Google tools. ESL Library – A wonderful site for ESL teachers looking to find lesson plans and flashcards. Scribble Press – A excellent site/iPad app for creating digital books and stories. Ideal for teachers with educational portal for creating student accounts. Teachem – A cool site for creating an online course by adding flashcard style questions to YouTube videos. Infuse Learning – A nice student response system that works on a wide variety of mobile devices. Doodlecast – A great iOS app for kids that allows them to create a drawing while recording their voice. Scribblenauts – One of my son’s favorite iOS platform games; it allows him to work on spelling to create objects. Mobento – A unique site that allows users to search for spoken words inside a video. SnaPanda – A great Android and iPhone app that uses a mobile devices camera to scan a word and give a definition. Found a tweet from Thinglink Edu about an interactive image of examples and uses of Thinglink in education. One of the examples was this interactive mind map created by Phillipe Packu. 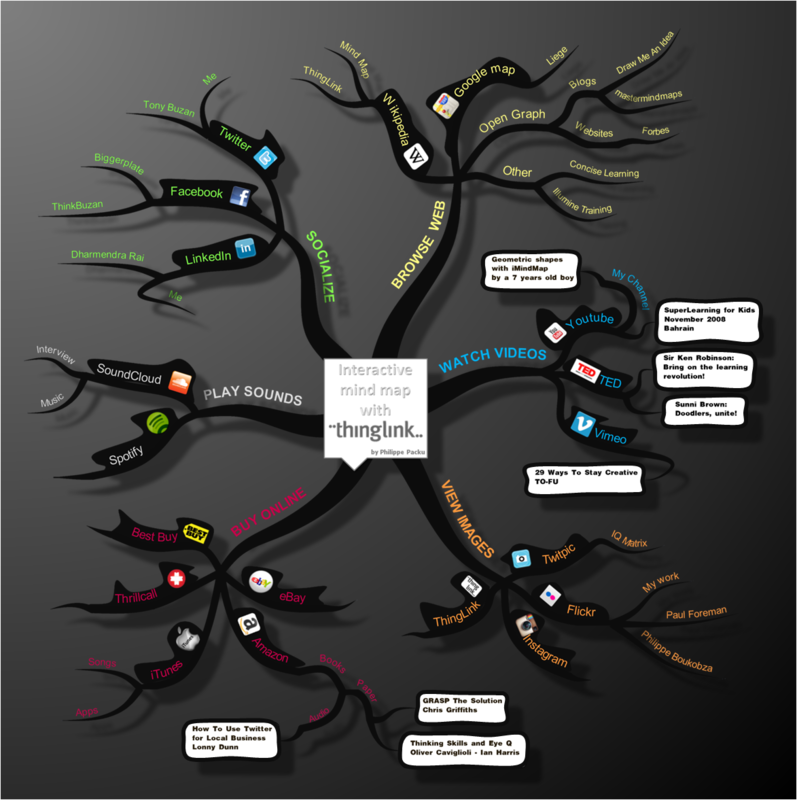 The mind map is a drawing that was uploaded to Thinglink then pinned with videos, images, audio files, and links to example each part of the mind map. I’ve embedded the mind map below. I love this (MentorMob)…and using iBooks Author on my MAC! 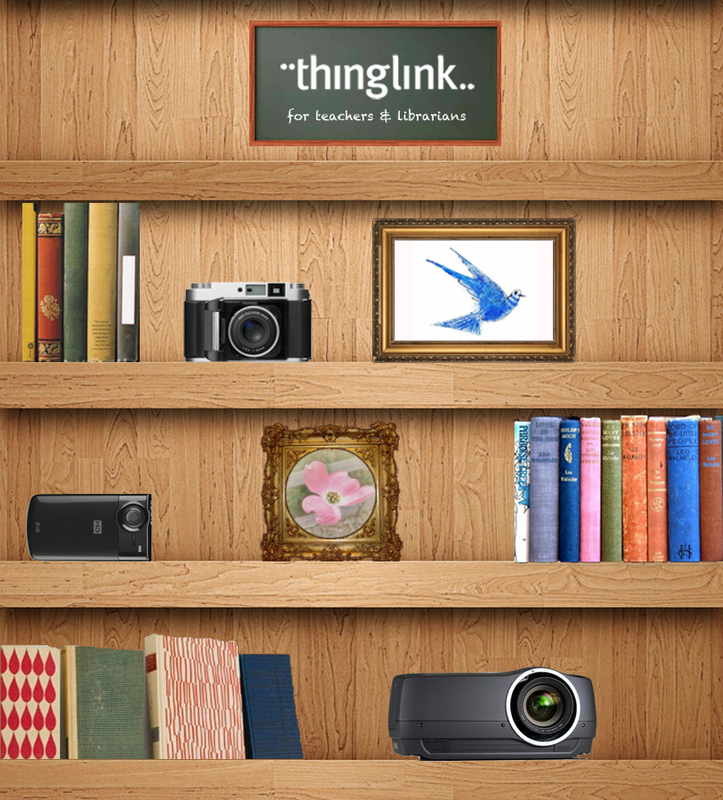 Thinglink is a tool for creating interactive images. Check out the Google Presentation below.